As the Harrison Chamber of Commerce Commemorates our 100th Year since the big fire that almost wiped us out, we remember the sacrifices and service of our volunteer firefighters of the St. Maries Fire Protection District. Left to right, front row standing, Cheryl Blevins, Kiefer Gibson, Clint Reed, Tim Kraack, Wes Rice, Craig Ogden, Mike Walters, Larry Naccarato, Brian Bigelow. Middle row standing, Cody Crane, Parker Telford. Back row standing, Josh Masterson, Donaven Rottini, Sitting on the back of the truck, Brendan Scheel, Philip Diffenbaugh, Nate Masterson, Toby Young, Layla Rice, Bethan Suchoski, Shelby Holder. 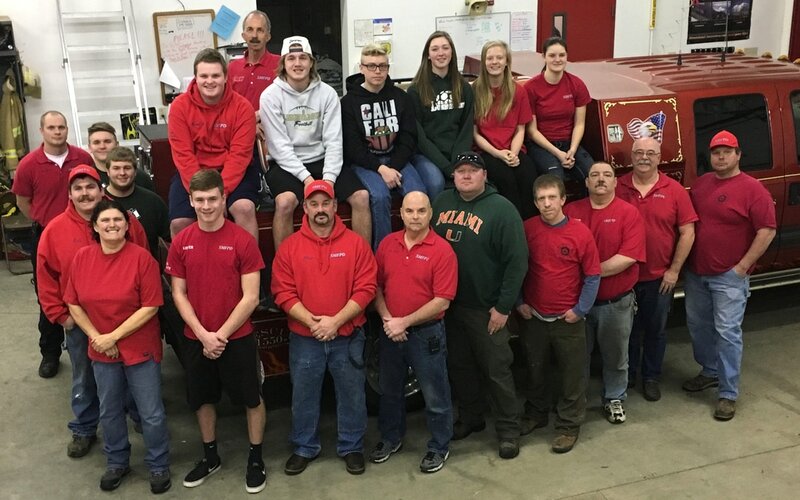 The St. Maries Fire Protection District consists of three fire stations and a total of forty volunteers, two paid administrators, and one paid fire chief. Fire department headquarters are at 308 W. Jefferson Ave., St. Maries, Idaho. For office business and to learn about becoming a volunteer firefighter, call 208-245-5253. In case of emergency please dial 9-1-1.